The Asian detective proved to be a popular hero with film-going audiences during the 1930s and 40s. 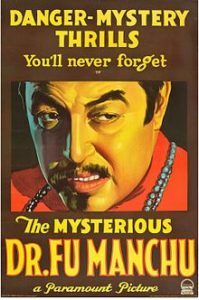 As Charles Mitchell notes, Charlie Chan—the Chinese detective from the Honolulu police—was the only serious rival to Sherlock Holmes as one of the most beloved screen detective, appearing in 47 films between 1926 and 1949 (ix). 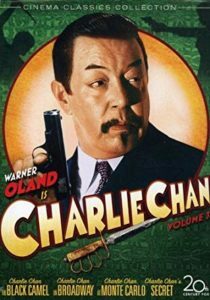 There has been much debate by scholars and critics over whether or not the Asian detective like Charlie Chan represent a positive image of Asian masculinity. He has been regarded as positive because he is a hero (unlike the infamous villain Fu Manchu) and works to reinstate social order on the side of the law; however, he has been seen as negative because he is presented as a servant to Western interests and is played in “yellowface” by a white actor rather than by a Chinese or Chinese-American actor. Although controversial and often regarded as racist, the representations of the Asian detective through the character of Charlie Chan, and his imitators Mr. Wong and Mr. Moto, offer insight into how Hollywood perceived of Asian and heroic masculinity. Fu Manchu’s popularity saw many imitations in fiction including Alexander Romanoff’s “The Blue-Eyed Manchu” in a 6-part All-Story Weekly serial, John Charles Beecham’s Ah Sing in the 1920 novel The Yellow Spider, and Edgar Wallace’s Fing-Su in the 1926 novel The Yellow Snake, and in film with “The Mysterious Wu Chung Foo” in a 4-part serial in 1914, Wu Fang in three silent serials starring Pearl White as The Lightning Raider (1919), and Baron Huroki of the 1917 series Patria (released in 1919). Biggers was surprised by the countrywide popularity of Chan as he had been concerned about the response to the benign portrait of a Chinese character on the part of American audiences (Rimoldi 170). Hollywood also seems to have feared that mainstream audiences would resist such a depiction of an Asian character: in the first three films in which he appeared—House Without a Key (Bennet 1926), The Chinese Parrot (Leni 1927), and Behind That Curtain (Cummings 1929)—Chan is only a minor character and gets little screen time. In 1931, however, 20th Century Fox released the first of 16 films starring Swedish-born actor Warner Oland as Chan and as the main character (Fox would produce a total of 27 Chan films between 1931 and 1942). Chan co-existed with Fu Manchu and, according to Jun Xing, the benevolent Chan offered the opportunity to “balance out” the diabolical Fu Manchu whose representation had dominated American conceptions of the on-screen Asian: “the Charlie Chan character became institutionalized as the nonthreatening Asian (read: a physical wimp, a sexual deviant, and a political yes-man)” (61). While Xing is more critical of Chan than many critics, the fact that Chan was “nonthreatening” seems to have been the key to his popularity with Hollywood studios—and perhaps mainstream audiences. As Oscar Rimoldi states, “He had erudition without arrogance, impeccable manners, perfectly tailored suits and a progeny of Asian Americans totally in tune with the American way of life” (170). And Rimoldi’s point is key: while Chan’s expertise as a detective may be the result of his Confucian understanding of human nature, his appeal to American audiences was the fact that he was polite, soft-spoken, well-groomed, and a caring and prolific family man who had adopted middle-class American values. In the case of Chan, it was his sidekick sons and daughters (Chan had a total of 14 children in the series) and that were fully Americanized while the detective, himself, existed in a liminal space between Chinese and American culture symbolized by his home: the mid-Pacific territory of Hawaii. In the case of Mr. Wong, however, it is the detective himself who is “Americanized:” he lives in San Francisco (but not in Chinatown); he was educated in a respected Western university (Yale in Hugh Wiley’s original stories and Oxford in the films); and, unlike Charlie Chan, he spoke “proper” (not halted or broken) English. Although Wiley had created many of the more negative stereotyped Chinese characters for the Saturday Evening Post, he introduced his Chinese detective James Lee Wong in Collier’s magazine in 1934. Between 1938 and 1940, Wong starred in a six low budget films for Monogram and was played by Boris Karloff in all but one. In the Chan films, the detective relies on observation and deduction while his “No. 2. Son,” Jimmy Chan (Victor Sen Yung), employs his skills gained studying criminology to assist in the solution of the mysteries; Wong, on the other hand, is adept at both the traditional and modern methods of detection. Like Chan, Wong occupies a liminal space between East and West: at home, he wears Eastern robes and has a Chinese houseboy; however, when on the job, he wears elegant Western suits (with his trademark white carnation in his lapel). In Mr. Wong, Detective (Nigh 1938), Wong completes a scientific test to identify the sound that was used to shatter the murder weapon: a glass ampoule containing a poison gas. He tries playing a variety of Chinese musical instruments, producing unmelodious sounds to the chagrin of his Chinese houseboy (and thus playing into the Western stereotype that Asian music is unpleasant). In the end it is the high-pitched shriek of his pet bird that shatters the ampoule but the scene offers a contrast between Wong’s Westerness as a man of science and education and his Easterness as a man of Chinese art and culture. It is explained in The Mystery of Mr. Wong (Nigh 1939) that the detective is “one of the five foremost living authorities” on ancient art and literature from the Orient. Okihiro’s description of Chan is as applicable to Wong: they “personified the cunning, sensuality, and mysticism of a feminine Asia (the body)” versus “the intellect, logic, and science of a masculine Europe (the mind)” (145). Similarly, the reviewer for the Motion Picture Daily praises the film for not duplicating Chan because, as the review implies, Chan seemed more interested “in coining philosophical wisecracks or kidding policemen” than actually apprehending criminals (6). Certainly, the Chan films had a large comic component with Chan’s African-American chauffeur (most often Birmingham Brown) and older offspring (mainly Lee, Jimmy, and Tommy) acting as foils to their father during the investigation; on the other hand, Mr. Wong is thoughtful, somewhat impassive, and mainly serious—although he does smile when he occasionally makes a humorous pun. According to Rimoldi, the Wong series was not meant to compete with Fox’s successful Chan series but instead to cash in on the popularity of the Asian detective (173). And the success of Mr. Wong was most likely due to the star who portrayed him—Boris Karloff, an Eurasian actor who had made his name playing in monster movies—and the publicity material highlighted Karloff’s name above all else. Both Chan and Wong can be regarded as positive representations of Chinese masculinity as they are cast as heroes but they are also often regarded by critics as the substitution of one stereotype for another. Following the Yellow Peril-inspired demonization of the Chinese in American culture came another stereotype—“the model minority”—which referred to immigrants who assimilated into mainstream society. As Chung explains, with Japan’s undeclared war on China throughout the 1930s, “the Chinese were viewed no longer as the oppressors, but now as the oppressed, seeking the aid of Americans” (540-41). This was reflected in films at the time with the smiling, hard-working peasant and other more “positive” portrayals of Chinese characters, including Chan and Wong, who fit very much into this new conception of the “model minority:” they were Chinese detectives who had assimilated into mainstream society and employ their skills to serve Western interests. The Japanese, however, would be portrayed in a different manner. Upon the death of Earl Derr Biggers, the editor of the Saturday Evening Post, George Horace Lorrimer, asked author John P. Marquand to develop an Oriental detective specifically to replace Chan (Tuska 178). The result was Kentaro Moto, a Japanese secret agent, although in some of the films he is specifically identified as a “Confidential Investigator for the International Association of Importers.” Mr. Moto made his film debut in 1937, played by Hungarian-born actor Peter Lorre who was made to look stereotypically “Asian” with steel-rimmed (sometimes horn-rimmed) spectacles, false buckteeth, and slicked-down hair. Lorre portrays Moto as a quiet, seemingly meek, detective who drinks milk when others have scotch; however, beneath a veneer of Asian politeness and small stature (Lorre was 5’5”) is a calculating, intelligent, and sometimes menacing man—unlike Chan and Wong. What differentiates Moto from the Chinese model minority detectives is his proclivity for violence. He is an expert in the martial art of ju-jitsu and, with the help of a stunt double, Lorre as Moto engages in many exciting fights. Moto explains to his class of budding criminologists in Mr. Moto’s Gamble (Tinling 1938), “Will you please remember, there’s no situation that science and skill cannot master.” One of his students challenges him asking what good are science and skill if one is confronted with an armed suspect; Moto answers by grabbing him and flipping him easily to the ground. Similarly, Moto is notable for his nonchalant attitude to witnessing or committing violence: he dispatches several villains per film with cool detachment—and sometimes seemingly unnecessarily when they could have been stopped by other means and arrested. The Moto films—perhaps because they are centered around international smuggling operations in far off lands—see a distinctly higher body count and serious injury of both allies and foes than the Chan and Wong films which follow more the “old manor” formula of the British classical detective stories. Lastly, Moto has a penchant for donning disguises—especially ones that help him to blend in in the exotic places in which he finds himself investigating mysteries. The function of this masquerade is to demonstrate Moto’s abilities to camouflage himself in any culture or locale in order to pursue a case unnoticed, but also to differentiate him from the even more exotic foreigners who populate those places. Only in costume does Moto sport a moustache, fez, or long robe rather than distinctly Western clothes. The films often begin with Moto in disguise and behaving in a mysterious or criminal manner so that audiences unfamiliar with the character (or who do not recognize him immediately) may mistake him for one of the villains: the pleasure then is when the disguise is removed to reveal the petite and meek detective. Moto is firmly identified with his star—Peter Lorre. Ken Hanke argues that it was Lorre’s off-center sense of humor that made the series good and Moto “no Chan clone,” but that the films suffer from being “too immersed in Peter Lorre’s personality” (255 and 257). Writers Willis Cooper and Norman Foster seemed well aware of that point as they note in their “Treatment” for Mr. Moto Takes a Chance (dated 25 March 1937) for the character description: “Mr. Moto—The quiet, immaculate Japanese character, as created by Peter Lorre.” (In fact, Lorre’s Moto was popular enough to spawn a parody in the Warner Bros.’ animated short film “Porky’s Movie Mystery”  in which Porky Pig plays “Mr. Motto” [sic] who reads up on ju-jitsu to fight The Invisible Man). The Moto films were popular but the series ended in 1939 after eight films in three years. Many critics cite rising anti-Japanese sentiment on the eve of World War II as the cause for the series demise (Fuller 298, Silver, Shim, and Wong 61). However, the Moto series ended two and a half years before the Japanese attack on Pearl Harbor and other critics have noted that there were a number of production problems including Lorre wanting to be released from the series and his contract with Fox that more likely account for the abandonment of the series (Tuska 187 and Wires 102-3). Indeed, according to Jon Tuska, Fox had three Moto films scheduled for the 1939-40 season (187). William Everson suggests that both Lorre’s movement to bigger roles and the war situation were responsible for the end of the series (82); certainly, America’s position regarding both China and Japan had altered over the 1930s. According to Sean Metzger, Japan’s “imperialist incursion” into Manchuria and explicit desire for control of northern China led to diplomatic tensions between Japan and the States and to a compassionate attitude for China on the part of Americans; this in turn resulted in sympathetic Chinese characters in fiction and film (3). I would suggest, that similarly Japan’s aggression towards China that culminated in the Second Sino-Japanese War (1937-45) might explain why Moto was withdrawn from the screen but also why he was differentiated from the benevolent Chinese detectives Chan and Wong while on it. The Japanese detective’s cool and calculated attitude towards violence may have been the result of the same factors that inspired the passive and patient Chinese model minority detective. Both the Yellow Peril and World War II saw the repolarization of Americanness and “otherness” (and the latter, the dominance of the hardboiled detective) but, in the years in between, Hollywood’s intention—even if misguided in its execution—was to offer the Asian detective as one of America’s heroes. The author gratefully acknowledges that financial support for this research was received from a grant partly funded by Wilfrid Laurier University Operating funds and partly by the SSHRC Institutional Grant awarded to WLU. Film reviews and other primary materials were viewed at the Margaret Herrick Libraryin Los Angeles. Anon. Mr. Wong, Detective [Review] Motion Picture Daily (3 Oct 1938): 6. Anon. Mr. Wong, Detective [Review] Motion Picture Herald (1 Oct 1938): 39. “Charlie Chan Family Home, The.” <http://charliechanfamily.tripod.com/> 25 May 2008. Chung, Sue Fawn. “From Fu Manchu, Evil Genius, to James Lee Wong, Popular Hero: A Study of the Chinese-American in Popular Periodical Fiction from 1920 to 1940.” Journal of Popular Culture 10.3 (1976): 534-47. Everson, William. The Detective in Film. Secaucus, NJ: The Citadel Press, 1972. Fuller, Karla Rae. “Creatures of Good and Evil: Caucasian Portrayals of the Chinese and Japanese during World War II.” Classic Hollywood, Classic Whiteness. Ed. Daniel Bernardi. Minneapolis: University of Minnesota Press, 2001. 281-300. Hanke, Ken. Charlie Chan at the Movies: History, Filmography, and Criticism. Jefferson, NC: McFarland & Co., 1989. Macdonald, Gina and Andrew Macdonald. “Ethnic Detectives in Popular Fiction: New Directions for an American Genre.” Diversity and Detective Fiction Ed. Kathleen Gregory Klein. Bowling Green, OH: Bowling Green State University Popular Press, 1999. 60-113. Metzger, Sean. “Patterns of Resistance? : Anna May Wong and the Fabrication of China in American Cinema of the Late 30s.” Quarterly Review of Film and Video 23.1 (2006): 1-11. Mitchell, Charles P. A Guide to Charlie Chan Films. Bibliographies and Indexes in the Performing Arts No. 23. Westport, CT: Greenwood Press, 1999. Rimoldi, Oscar. “The Detective Movies of the 30s and 40s: Part I.” Films in Review 44.5/6 (1993): 164-73. Rohmer, Sax. (1916) The Return of Dr. Fu Manchu. New York: Pyramid Books, 1965. Shim, Doobo. “From Yellow Peril through Model Minority to Renewed Yellow Peril.” Journal of Communication Inquiry 22.4 (Oct 1998): 385-409. Silver, Charles. “Think Fast, Mr. Moto—Films from the Archive.” New York: The Museum of Modern Art Department of Film (28 March 1994). Tuska, Jon. In Manors and Alleys: A Casebook on the American Detective Film. Westport, CT: Greenwood Press, 1988. Wires, Robert. John P. Marquand and Mr. Moto: Spy Adventures and Detective Films. Muncie, Indiana: Ball State University, 1990. Wong, Eugene Franklin. “The Early Years: Asians in the American Films Prior to World War II.”Screening Asian Americans. Ed. Peter X Feng. New Brunswick, NJ: Rutgers University Press, 2002. 53-70. Xing, Jun. Asian American through the Lens: History Representations, and Identity. Walnut Creek, CA: AltaMira Press, 1998.